As Oscar season grinds into gear, one of the most interesting questions has been whether Netflix would finally bow to old-school tradition or once again try to turn Hollywood convention upside down. The streaming giant has bowed to tradition, it turns out, but only a bit, accommodating the desires of some of the world’s best filmmakers for their promising Oscar contenders. It’s a notable compromise that could once again nudge the rest of the movie business a little further into the future. Pretty much at the same time that Netflix reported adding another 7 million subscribers (it’s now at 137 million worldwide) and issued $2 billion more in junk-bond debt (it’s now at $10 billion), it also set one- to three-week theatrical-only releases for three films before they debut online. That’s a big step for Netflix, which long maintained a “day-and-date” release strategy regardless of film or filmmaker. Company executives said such simultaneous theatrical and online releases meant that its paying subscribers saw Netflix films as soon as possible. But that approach also turns theatrical runs for its features into near-vestigial exercises, confined to a few arthouse theaters willing to carry such projects. Usually, theater owners insist on about a three-month delay (in France, it’s legally three years) between the theatrical and other release windows for a film. Otherwise, the theater owners say too many people will just wait until the movie shows up on DVD or a streaming service or cable, and won’t come to their fine venues. Netflix effectively has blown off the theatrical release window, even though that still generated $11.2 billion last year for the studios that play according to traditional rules. And as a side effect, Netflix has also handicapped its film awards campaigns, bypassing the huge media machine that churns around any good-sized traditional theatrical release. Over the past several years, Netflix shows have won Emmys and Golden Globes, and it’s had some modest success in lower-profile Oscar categories. But this year, Netflix loaded up on prestige films from prestige filmmakers, the kinds of projects and players who are used to winning big iron in awards season. Unsurprisingly, those filmmakers want a real shot at Oscar for their latest prized projects. Pressure on Netflix increased further when two of its movies won big at the Venice Film Festival. 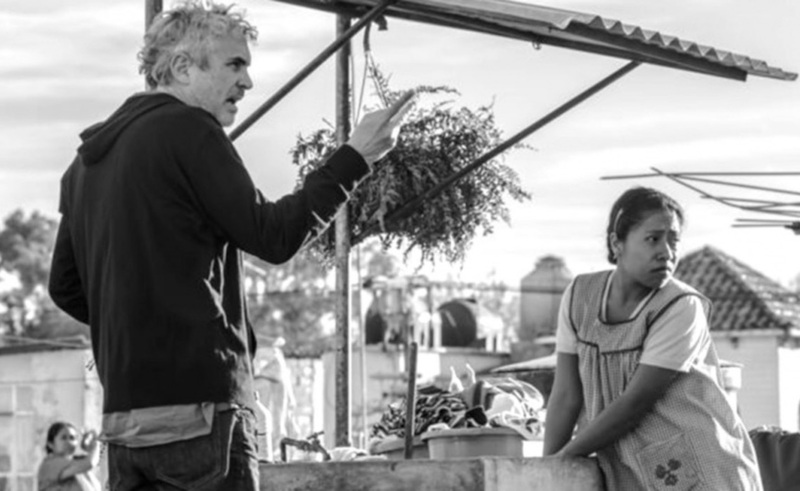 Alfonso Cuaron‘s Roma won the Golden Lion, the top award. And The Ballad of Buster Scruggs, directed by the Coen Brothers, won best screenplay. Success in the late-summer festivals such as Venice is often a first big step on the Oscar campaign trail. Add strong critical reviews, as both films received, for projects from multiple-time previous Oscar winners, as both Cuaron and the Coens are, and you have real potential for more awards gold. Netflix also added a third film to its new awards schedule, Bird Box, described as “a post-apocalyptic horror film” (side note: isn’t pretty much everything after an apocalypse horrific, or is that just my imagination?). Bird Box features a top-notch cast of previous Oscar and Emmy winners, including Sandra Bullock, Sarah Paulson, Jacki Weaver and John Malkovich. Danish-born director Susanne Bier is less prominent in the United States, but has a big stack of gold of her own, including an Emmy for directing the (truly great) limited series The Night Manager. She also directed In a Better World, which won the 2010 Oscar for Best Foreign-Language Film, and After the Wedding, which was a 2006 Oscar nominee. Bird Box‘s acquisition by Netflix wasn’t a huge surprise. One of its producers is Scott Stuber, who later became head of the feature film division at…Netflix. Under the new Netflix approach, Bird Box premiered at this week’s AFI Fest (though Netflix cancelled the red carpet event for the film because of the recent mass shooting and wildfires in Southern California). It’s schedule to hit theaters in four cities in about a month, on Dec. 13, then expand its theatrical presence eight days later and debut on Netflix that same weekend. Buster Scruggs already arrived in theaters this week in London and three U.S. cities. It debuts on Netflix this Friday (Nov. 16), alongside an expanded theatrical release. The biggest change will be for Roma. It arrives in theaters in New York, Los Angeles, and Cuaron’s native Mexico the day before Thanksgiving, then will expand elsewhere in the U.S. and to about 20 overseas markets over the next two weeks before hitting Netflix and an even wider release on Dec. 14. These modified schedules mark relatively small concessions by Netflix that will give filmmakers some of the promotional push and visibility they want as awards season begins in earnest. But the modest changes also suggest a way forward not just for Netflix but for other companies hoping for glory with the kinds of small prestige films that most benefit from awards season. Running an Oscar campaign can be an expensive proposition for a serious contender, absorbing even more money than some films cost to produce in the first place. If the new Netflix approach can help Roma, Buster Scruggs, and Bird Box grab nominations and wins, it’s not hard to imagine smaller distributors will try to structure deals that make their films available online sooner, to get more people to see the projects. Maybe those shortened release windows happen only in the United States, shortly after an initial theatrical run in the heart of Oscar season. In Hollywood parlance, it could be the digital equivalent of “four-walling,” where a distributor hires out a theater to show its film for awards qualification or consideration. After that awards-season period ended, the distributor could then shop the film in other territories and even other online providers. If that happens, it would mark yet another way Netflix has managed to turn the industry upside down, in ways big and small.